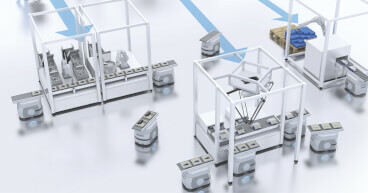 Demonstrating solutions from over 70 equipment suppliers including Omron, the connected factory demonstration at the Global Industrie exhibition will be one of the highlights of the event. Attendees will be able to watch as their individual medals are manufactured and packaged, with Omron’s LD robots playing a key role in moving the medals between the different stages of the production process. The Global Industrie exhibition takes place from 27 to 30 March at the Parc des Expositions in Paris Nord Villepinte. Dedicated to the factory of the future, it is the perfect venue to experience Omron’s intelligent automation system solutions. In addition to participating in the smart factory demonstration, Omron will also be demonstrating a complete hardware and software solution together with leading system integrator Capgemini at stand 3H19. The complete solution, which combines hardware from Omron with Capgemini’s secure cloud and data mining services, has the ability to select only relevant data for analysis, allowing smart equipment monitoring with a goal of zero defects and improved operational efficiency. Integration and secure communication are critical to building tomorrow’s smart factories. Demonstrating its commitment to open standards and smart, secure data transfer, Omron can also be found at the OPC UA Foundation Journey Stand (3E28), and at the Collectif IO.link stand (4S49). This year, the 4-day long Smart Industries exhibition is expected to attract over 50,000 visitors who will be able to network with 400 exhibitors on the theme of the connected smart factory. The event features a wide range of activities, from top-notch conferences to a competition for young people. It is a global event for the manufacturing sector and is backed by the Industry of the Future Alliance and the President’s office.